For the chance to win an original Lino Artwork by Garth Jennings and a copy of The Deadly 7 by Garth Jennings, listen to the audio clip and answer the question. Good luck! nelson stumbles across a machine, invented by christopher wren and buried for hundreds of years. designed to extract the 7 deadly sins, the machine had a fault – once extracted, the sins became living, breathing monsters who would then follow the sinner around for eternity (unless they ate him first, in the case of the particularly sinful). nelson accidentally extracts 7 deadly monsters from his own little soul. ugly, cantankerous, smelly and often the cause of much embarrassment, nelson's monsters are the last thing he needed in his life, but at least they're fairly harmless. when he learns of their individual powers he realises the monsters can be put to good use, and together nelson and the deadly 7 set out on a quest across the globe to find and rescue his big sister. the deadly 7 is a monster adventure by garth jennings and is packed full of hilarious illustrations. for the chance to win an original lino artwork by garth jennings and a copy of the deadly 7 by garth jennings, listen to the audio clip below and answer the question. good luck! which club does nelson join? the competition is closed. thanks for entering. all entries must be received by 23:59 on sunday 14 august 2016. please read the terms and conditions below. please read these terms and conditions carefully. by entering into this prize competition to win original lino artwork by garth jennings (“promotion”), you agree that you have read these terms and that you agree to them. failure to comply with these terms and conditions may result in your disqualification from the promotion. 1. this promotion is run by macmillan children’s books a trading division of macmillan publishers international limited a company registered in england with registered number 02063302 and registered office at cromwell place, hampshire international business park, lime tree way, basingstoke, hampshire, rg24 8yj (“promoter”). 4. the promotion is open for entries between 00:01 on saturday 16 july 2016 and 23:59 on sunday 14 august 2016. 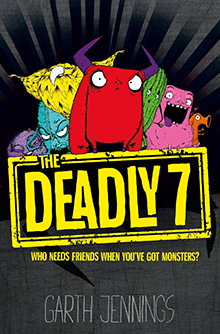 9. the prize for the promotion consists of the following: one piece of original lino artwork by garth jennings and one copy of the deadly 7 by garth jennings will be awarded to 5 winners, subject to availability. 10. the prizes shall be awarded as follows: one winner will be randomly selected. the decision will be final and no correspondence will be entered into. 13. the winner(s) will be required to confirm acceptance of the prize within 7 working days and may be required to complete and return an eligibility form stating their age and residency details, among other details. promoter will endeavour to ensure that winner(s) receive their prizes within 30 days of the date they confirm acceptance of the prize. if a winner does not accept the prize within 7 days of being notified, they will forfeit their prize and promoter reserves the right to choose another winner(s). promoter’s decision is final and promoter reserves the right not to correspond on any matter.